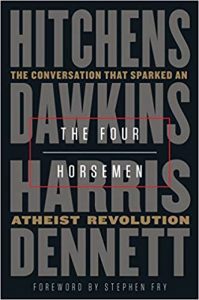 The Four Horsemen: The Conversation That Sparked an Atheist Revolution, by Richard Dawkins, Daniel Dennett, Sam Harris, and Christopher Hitchens, with foreword by Stephen Fry (Random House, 2019, ISBN 978-0525511953). 160 pp. Hardcover, $13.69. The Four Horsemen is a transcript of a 2007 conversation between four prominent public intellectuals, each the author of a bestselling book challenging the intellectual and moral credentials of religion. Its participants were the celebrated evolutionary biologist Richard Dawkins (The God Delusion), the grandfatherly philosopher Daniel Dennett (Breaking the Spell), the brash neuroscientist Sam Harris (The End of Faith and Letter to a Christian Nation), and the crusading journalist Christopher Hitchens (God Is Not Great). Their conversation was an invigorating example of what happens when astute, inquisitive minds engage together on deep questions. We’re fortunate that the exchange was captured on film, and the video has since been viewed millions of times online. Why, then, do we also need the book? I find that the print volume adds something new to the public record: not only do the surviving members of the foursome—Dawkins, Dennett, and Harris—each weigh in with fresh thoughts on the subjects they discussed, the text affords a different, more reflective way of processing the truly vital exchange of ideas. This slim volume at only 130 pages is chock full of observations that secular readers will find thrilling and believers will find challenging. Those concerned to understand religion as a natural phenomenon will derive special benefit from ruminating over its pages.